Imagine, if you will, fresh jalapeno peppers, cucumbers, vinegar, and a touch of salt splashed on a gooey grilled cheese sandwich. And this spicy delicious splash is only 0 Weight Watchers Points. Interested? 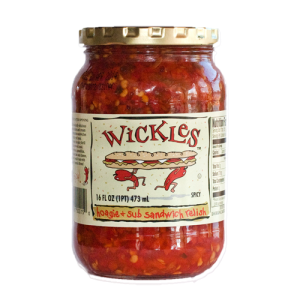 Wickles Hoagie and Sub Sandwich Relish is a must have in my household. It livens up everything from bagels with cream cheese, vegetable fajitas, to that steaming pot of black-eyed peas. It's available at Walmart and Amazon, and possibly at your local grocery store. Serving Size is 1 tablespoon.